The Philippines has been occupied by the Spain for almost 4 centuries and the Spanish influence has someone remained in the country. From our religion to our traditions and even to our food. Dishes like Caldereta, Menudo, Afritada, and even the much revered Lechon is somehow influenced by our old colonial masters. Very few Filipinos though do not know how "real" Spanish cuisine taste like. If you are curious about authentic dishes from beloved Spain and you happen to be in Cebu then head down to Ramos Street check out Ipar's Restaurante Y Bar de Tapas. 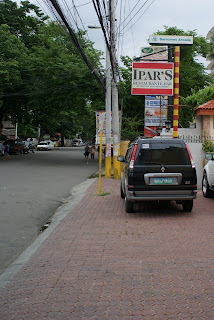 Ipar's is a restaurant that doubles as a Tapas Bar. Chef and Owner Ipar Miranda wants Cebuanos to taste and experience the real taste of Spain. One can enjoy familiar favorites like Gambas Al Ajillo, Spanish Chorizo, Calamares, Paella, Callos, Caldereta and Lengua carefully prepared to seemingly transport diners from Cebu to Madrid, Barcelona or Bilbao. There are so many entrees to choose from. From Tapas to Sopas to Aves to Pescasdo to Carnes to Postres, one can a great Spanish culinary journey at Ipar's.